The One Touch: Creating Healthy and Energy Efficient Housing program is directed and managed by Tohn Environmental Strategies. Led by founder, Ellen Tohn, Tohn Environmental Strategies is nationally recognized for its expertise in environmental health, healthy housing, green building, indoor air quality and lead poisoning prevention. 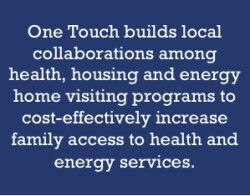 The One Touch: Creating Healthy and Energy Efficient Housing initiative was recognized by the U.S. Department of Housing and Urban Development (HUD) as a model program integrating health, housing and energy services. We pride ourselves on our responsiveness to client needs and long term client relationships. We help developers, architects, designers, and multi family housing owners/managers create and maintain green and healthy buildings. Federal, state, and local agencies seek our assistance when developing and evaluating health, environmental, and housing programs. Non-profit organizations come to us for strategic assistance in designing initiatives, managing advocacy campaigns, and structuring innovative collaborations across public and private sectors.